Most people know that upon death your body’s muscles are stiffened by the phenomenon of rigor mortis, but not many know that rigor mortis also causes your body’s muscles to play a Southeast Asian sport resembling volleyball using a woven rattan ball. 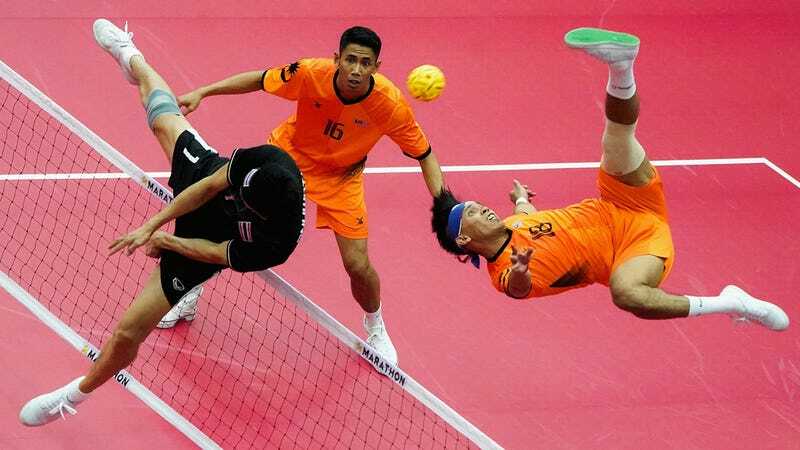 It’s called sepak takraw, and unlike volleyball, players can use any part of their body besides their hands to launch the ball over the net, which allows corpses with limited dexterity to ably compete using whatever appendages still retain some posthumous function. Despite most Americans never having even heard of the sport, it’s so popular in Asia that it’s expected to become an Olympic event, potentially making it the first Olympic sport you keep playing after you die. Here’s some information that’s as fascinating as it is creepy: Long after brain function has stopped, residual electricity left in your body will cause it to play elephant polo. This curious bodily function was first noted in 1862 by a mortician who observed that corpses would “commonly compete professionally in the obscure sport of elephant polo” even after they’d been embalmed. Occasionally, grieving family members have even had the displeasure of witnessing their loved one’s corpse leave an open casket to climb atop an elephant and competently play this Indian sport. The fact that you keep playing the bizarre Finnish sport of wife carrying—where men compete carrying women through obstacle courses in the fastest possible time—postmortem seems almost supernatural. But like anything, there’s a rational scientific explanation for your body playing such a strange foreign sport after it dies. Decomposition during the body’s putrefaction stage produces gases that propel the body to continue some natural physical functions even after death, twitching and spasming in a sufficiently coordinated manner to compete in this unusual Nordic racing sport for up to five weeks after death. It’s really not all that mind-blowing once you understand that your dead body is simply responding to ordinary internal chemical reactions that trigger the same physiological wife-carrying impulse you experience every day while still alive.